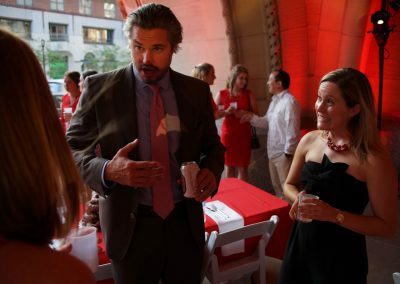 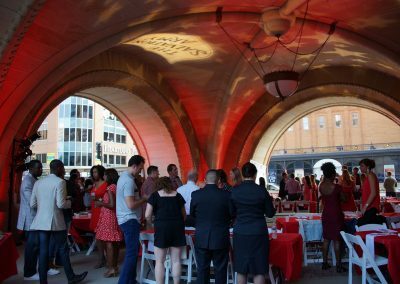 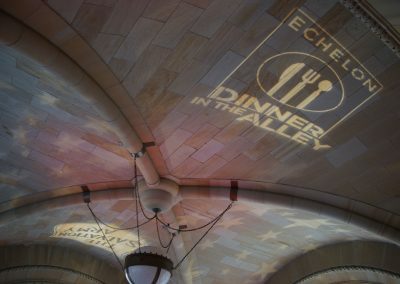 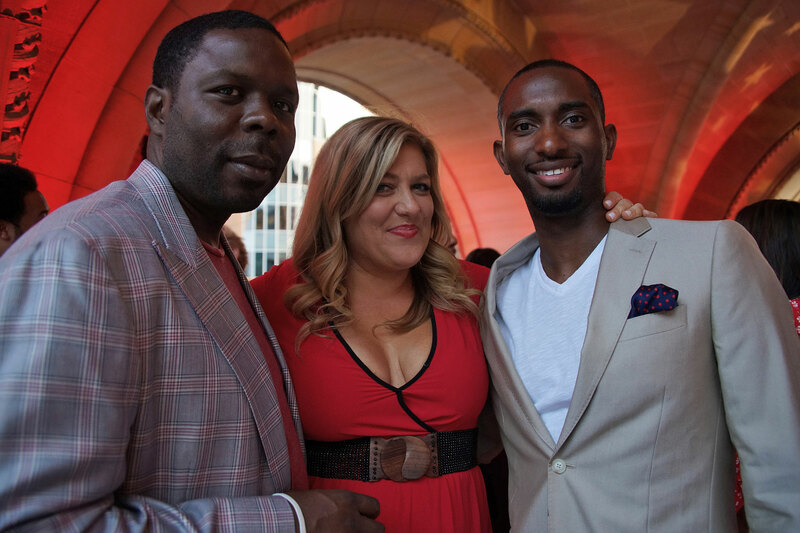 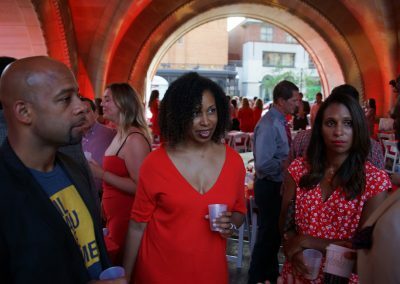 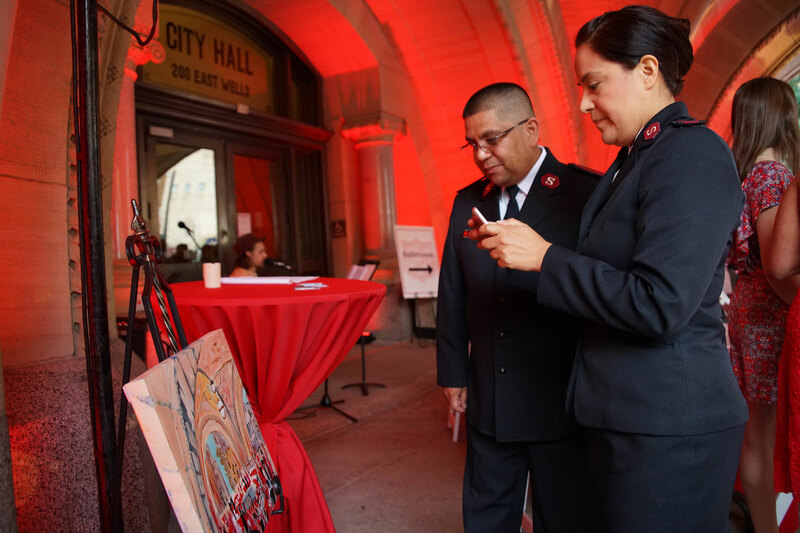 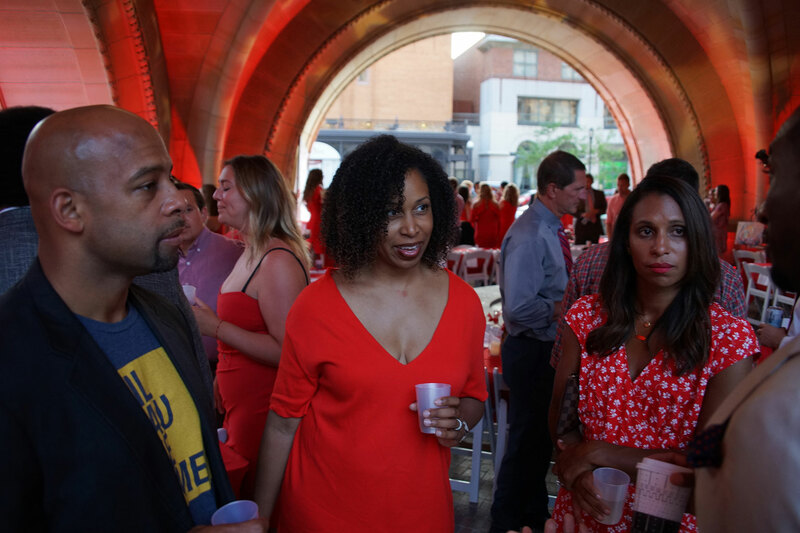 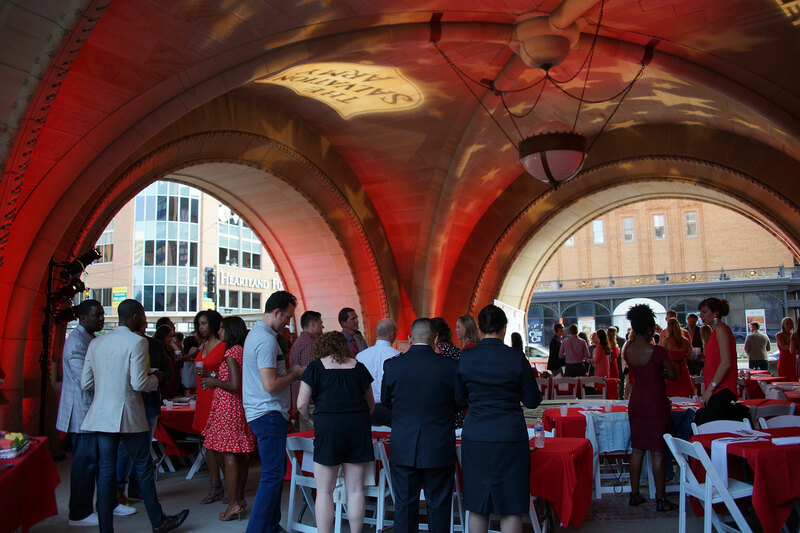 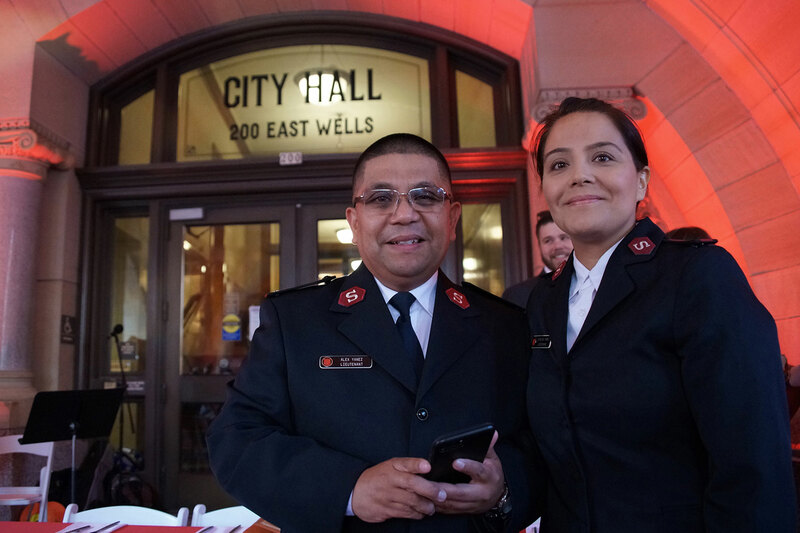 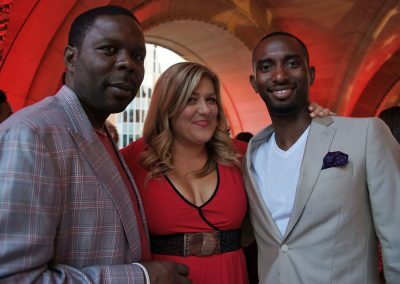 The 3rd Annual “Dinner in the Alley,” hosted by The Salvation Army of Milwaukee County’s Echelon Chapter, was held on July 27 to raise money in support of the organization’s vision to end homelessness. 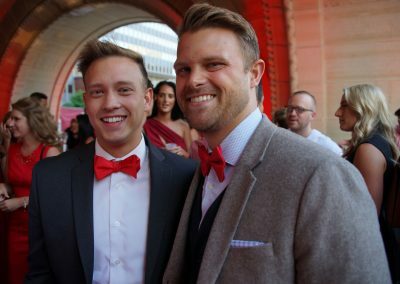 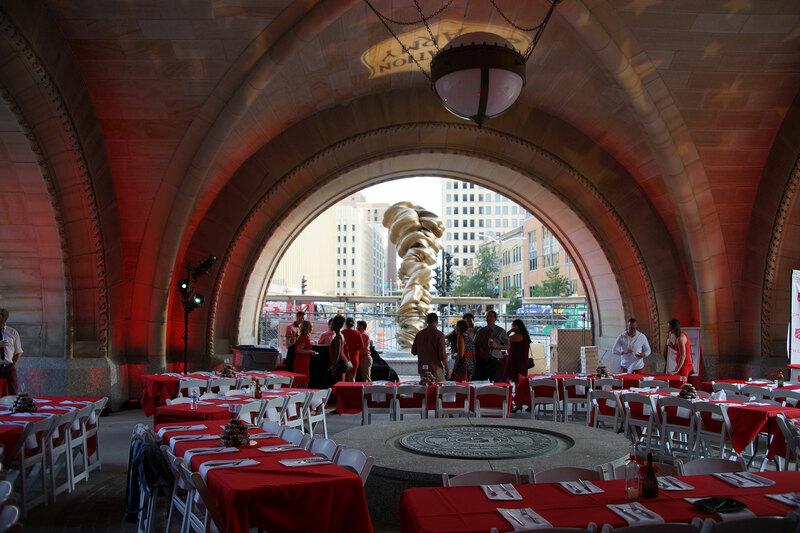 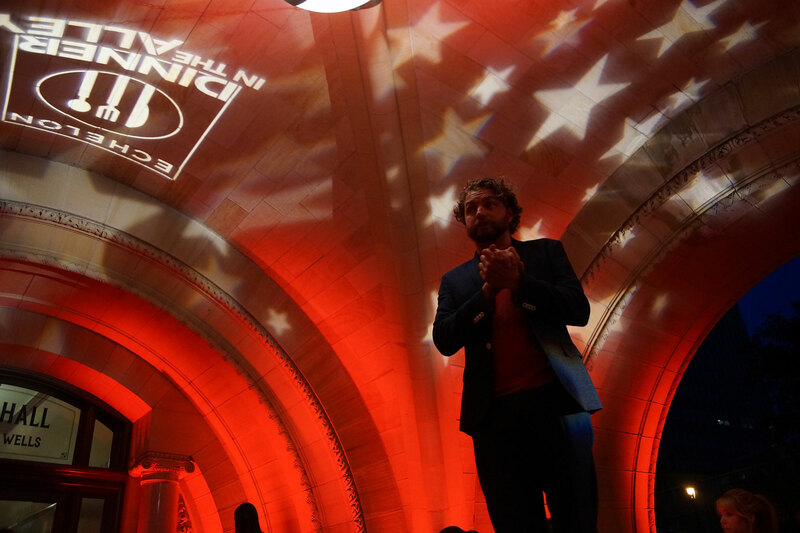 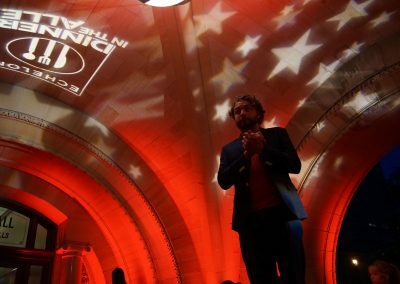 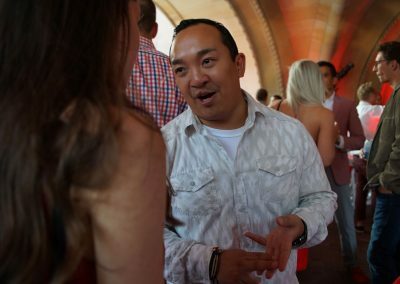 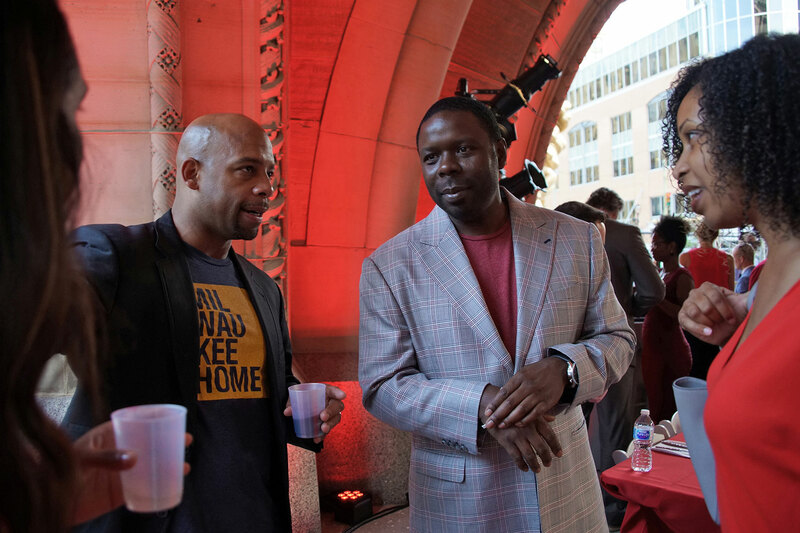 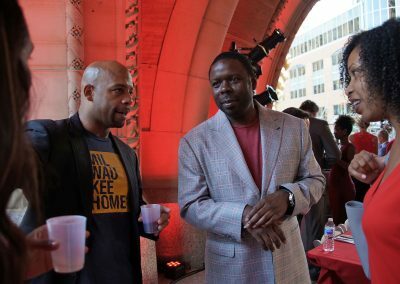 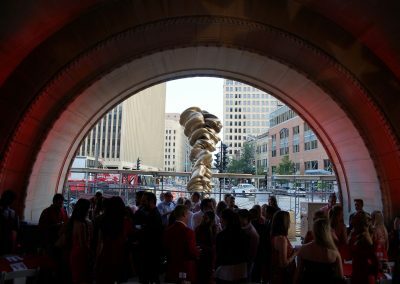 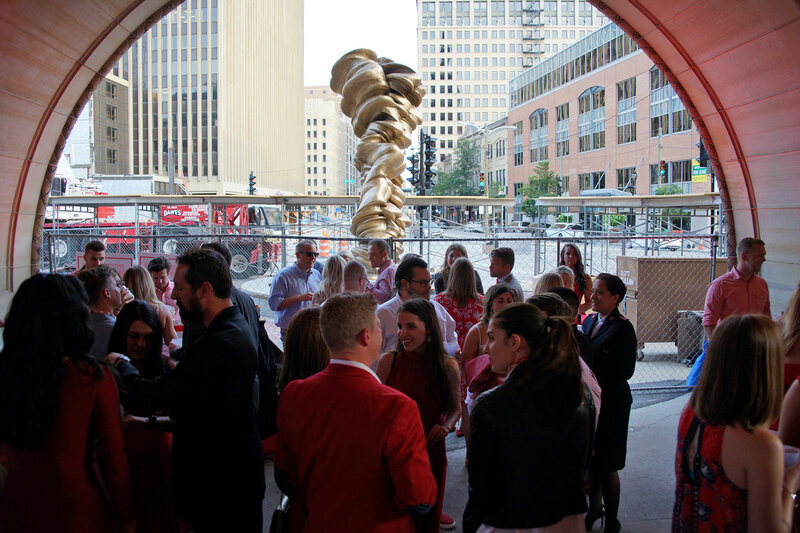 With inclement weather being a factor in previous events, the overhang of Milwaukee City Hall was selected as the location for this year’s gathering. 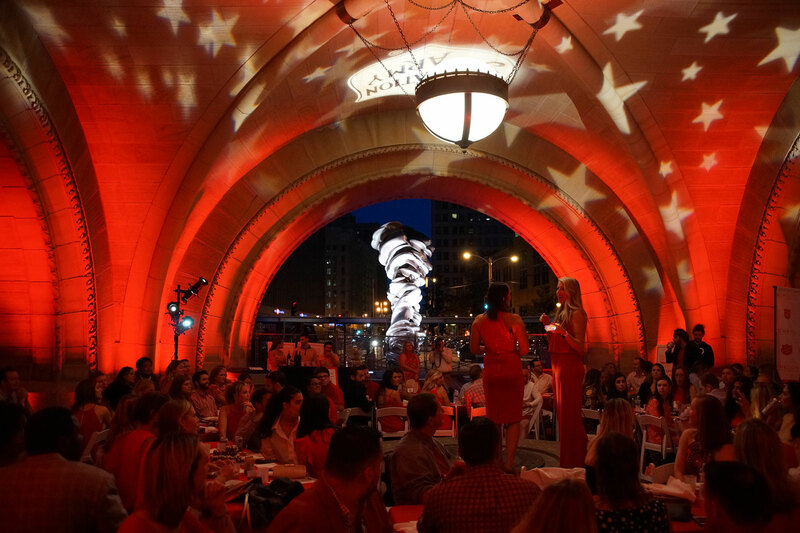 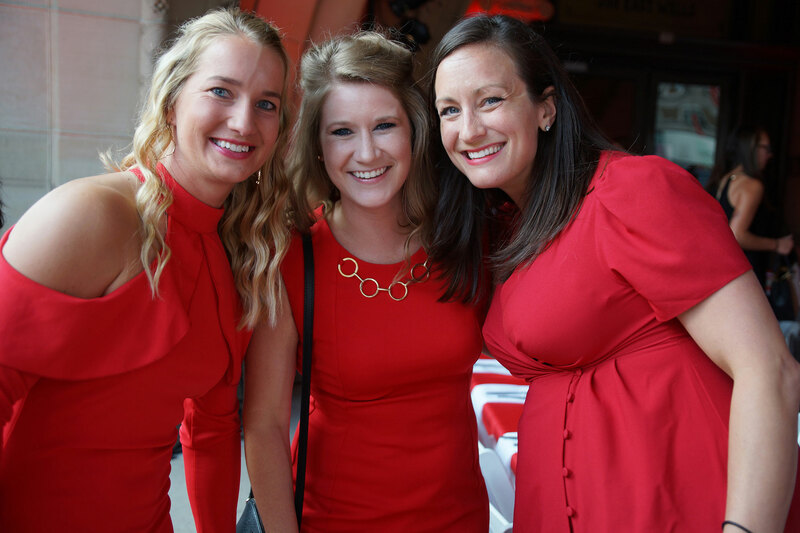 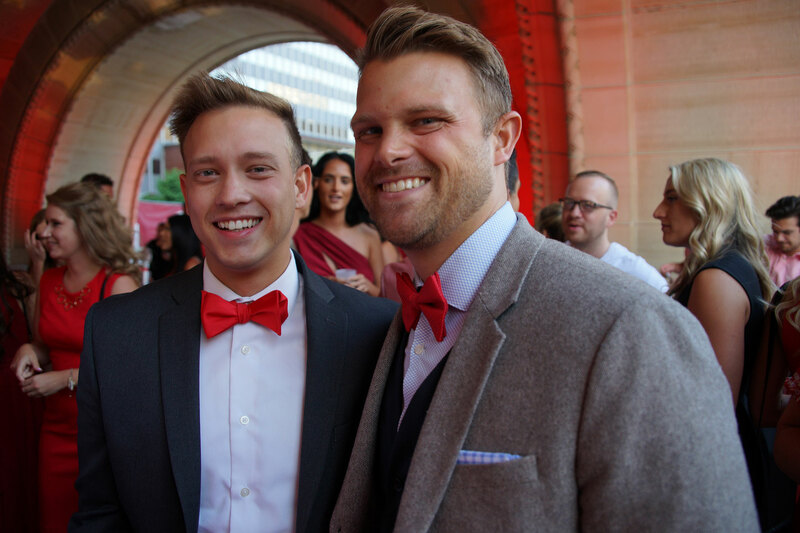 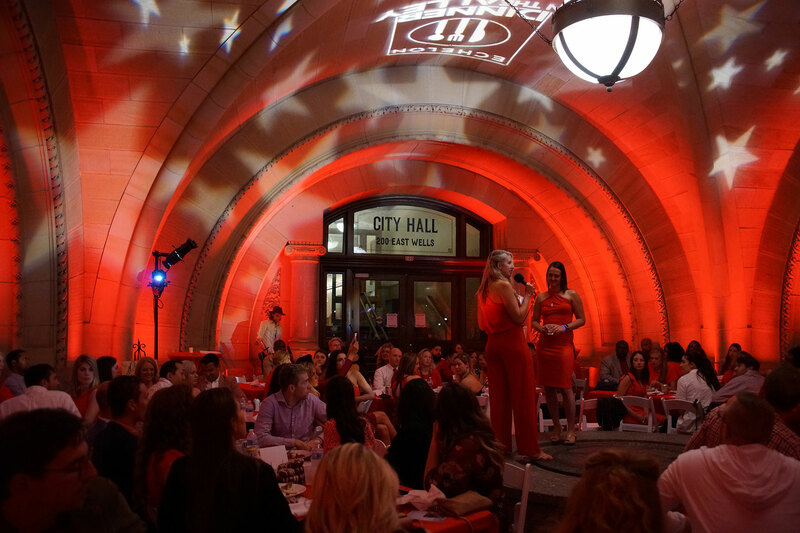 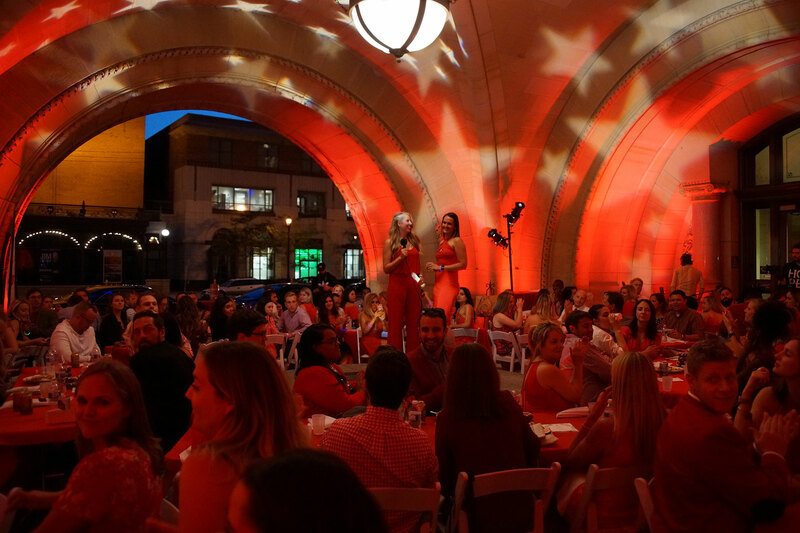 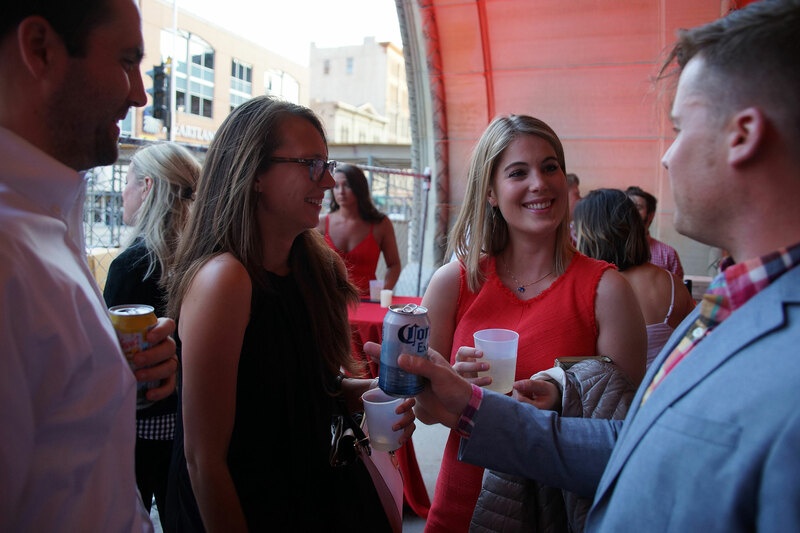 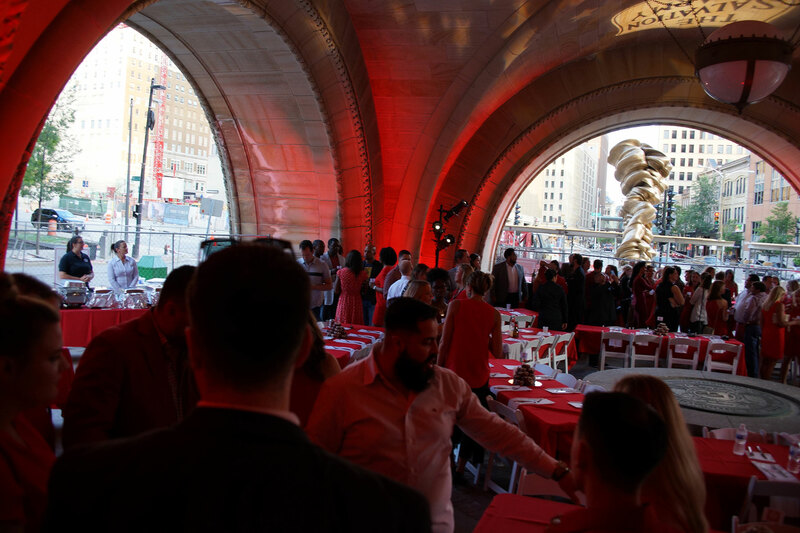 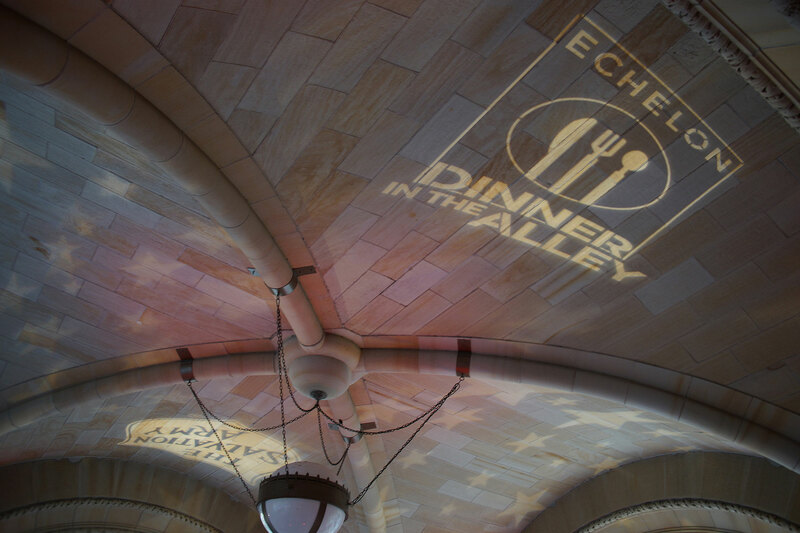 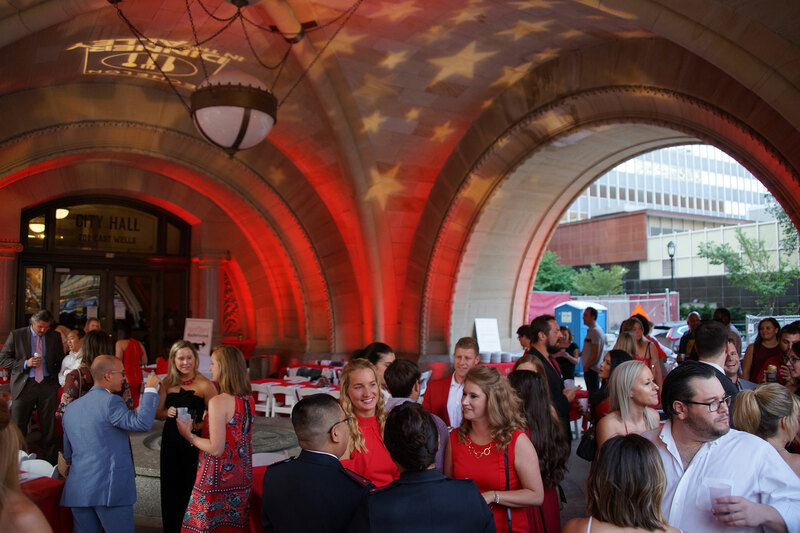 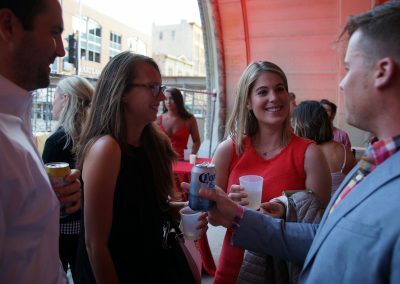 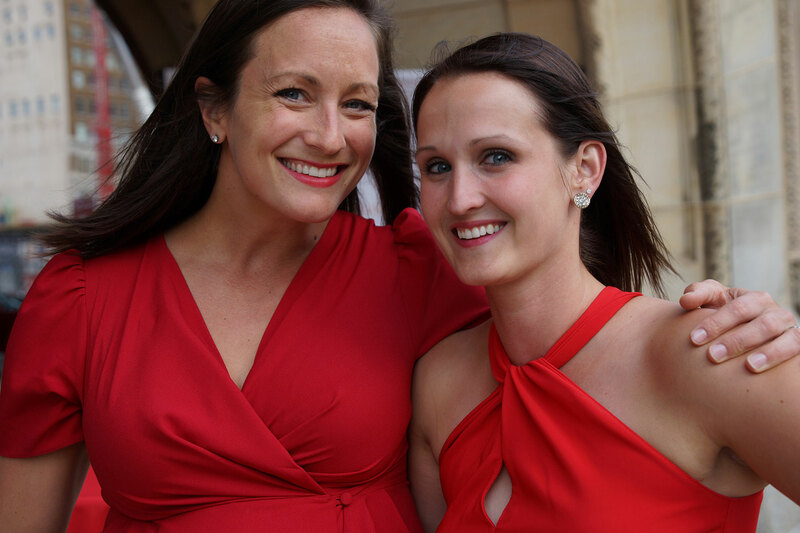 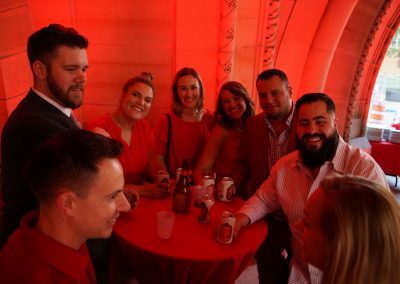 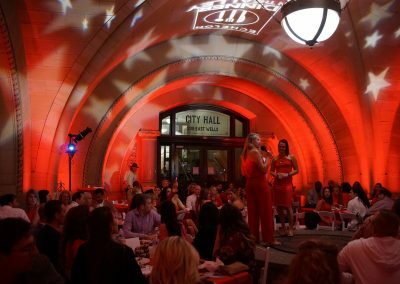 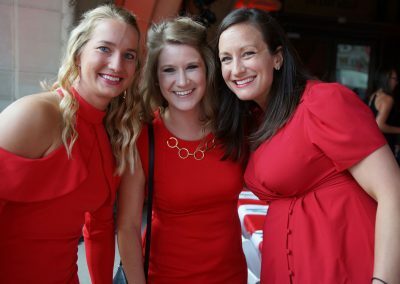 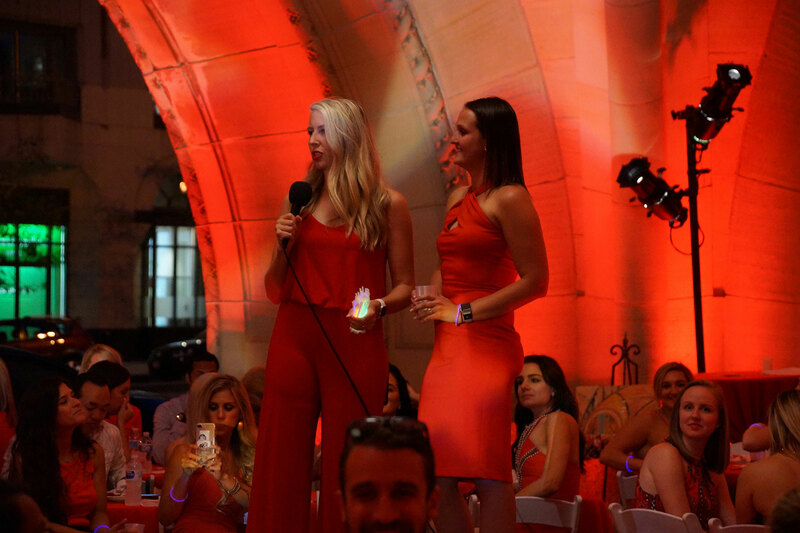 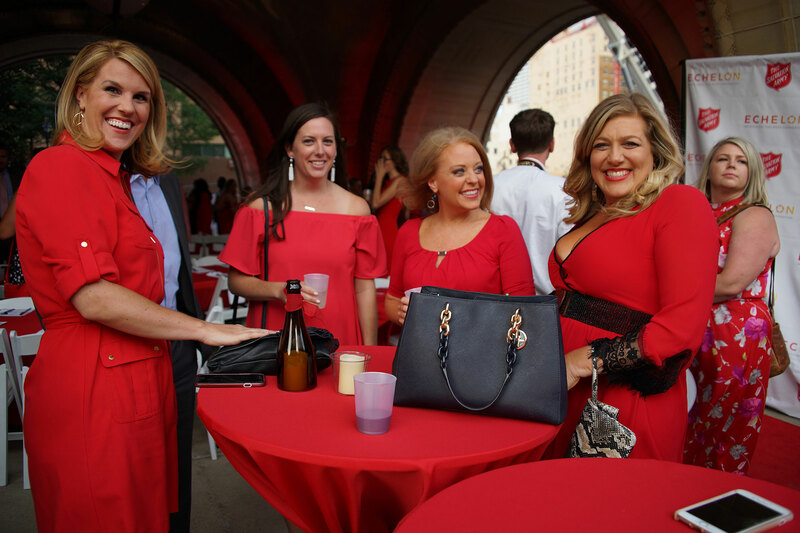 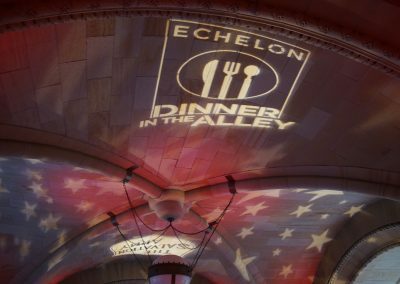 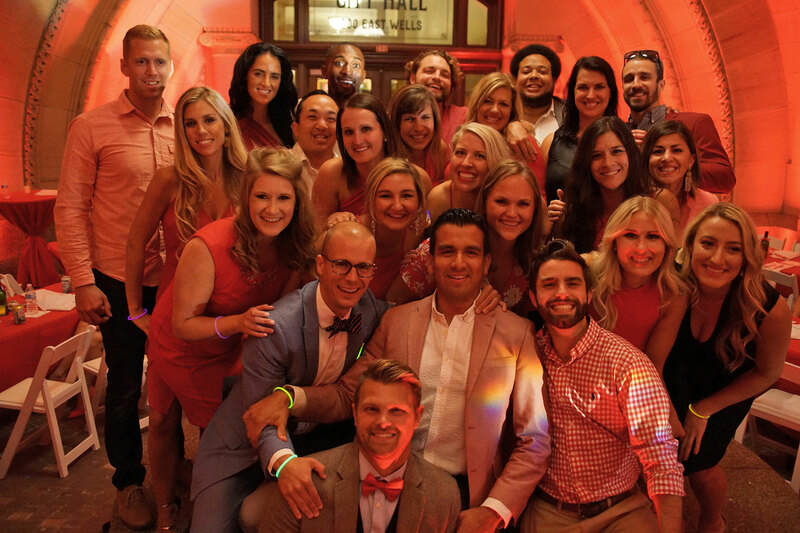 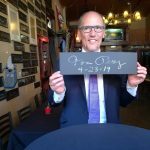 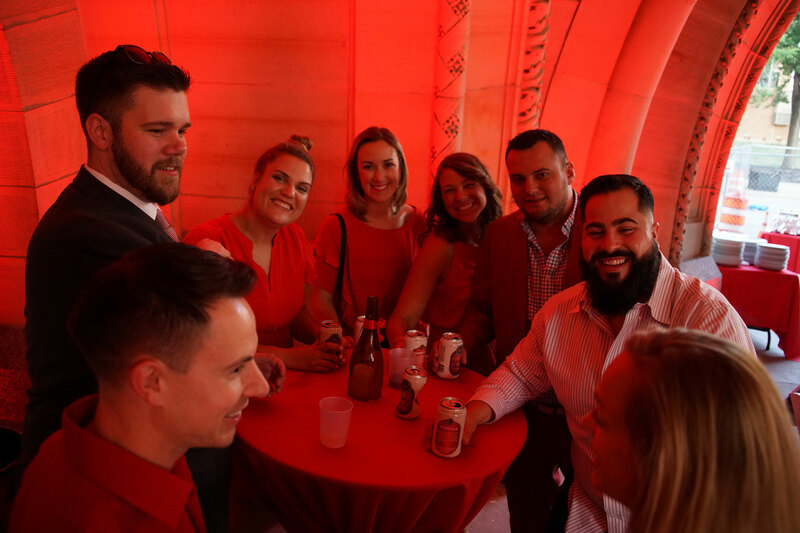 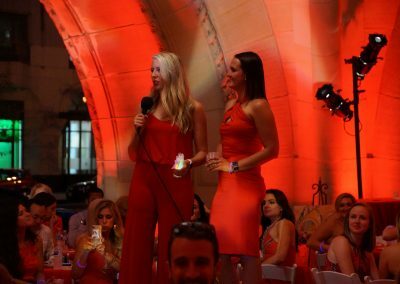 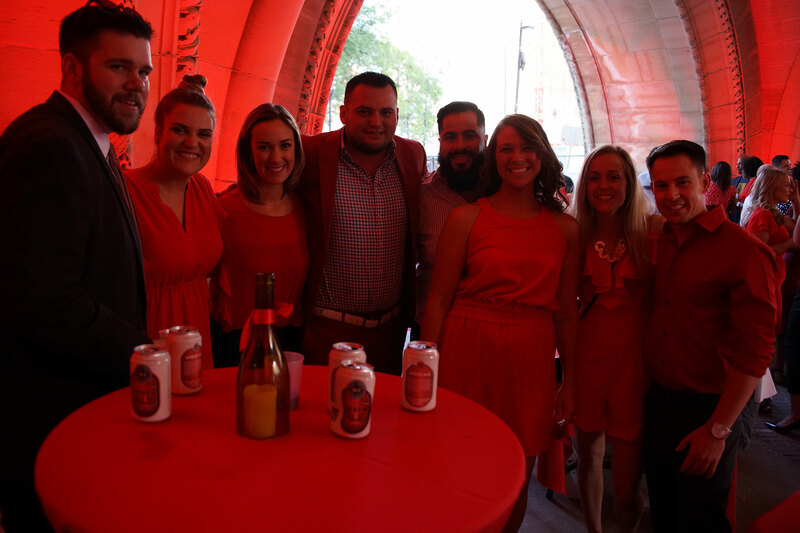 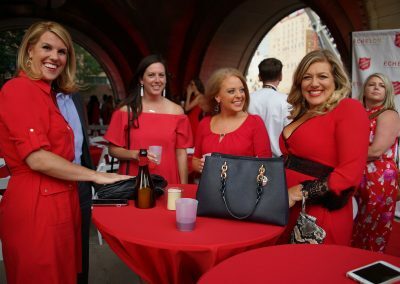 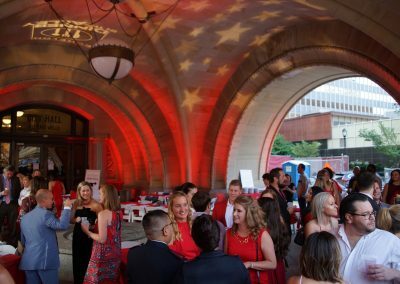 Along with the February event “Red Tie in the Sky,” “Dinner in the Alley” are 2018 fundraising efforts organized by the Echelon group. 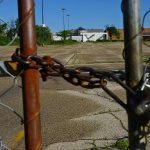 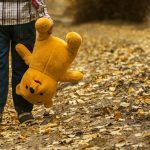 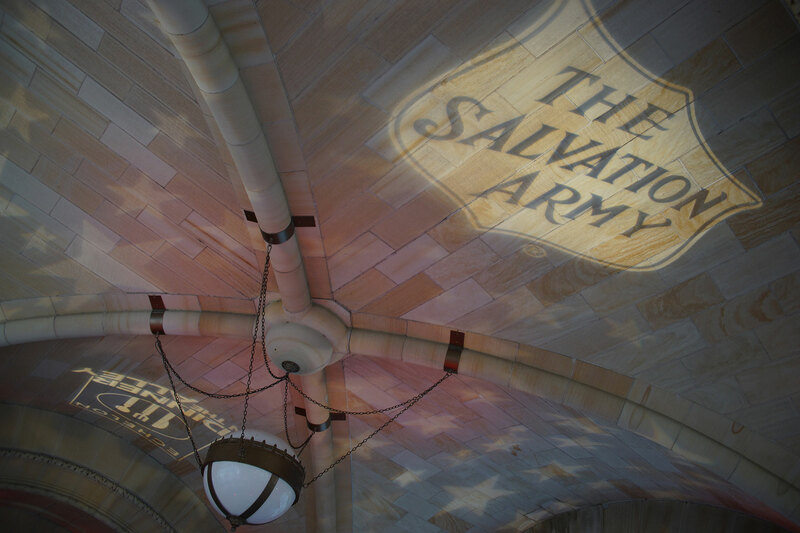 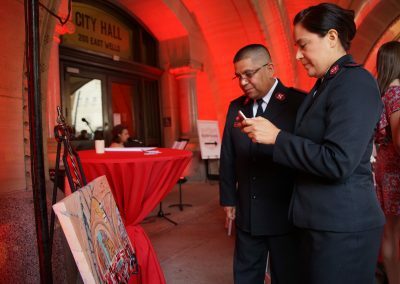 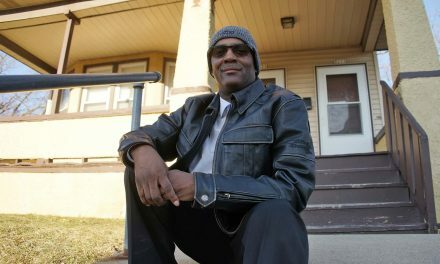 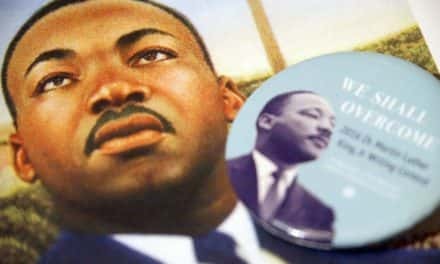 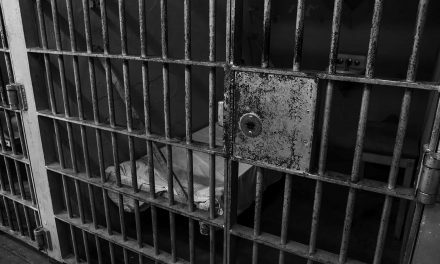 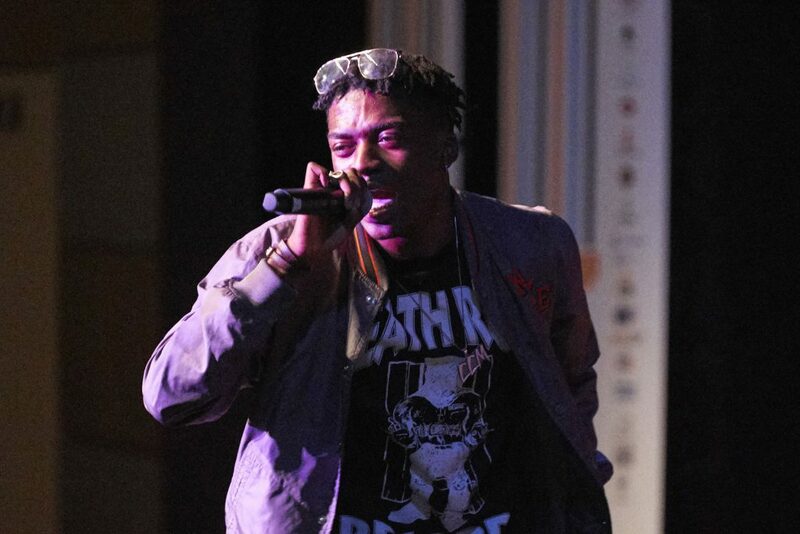 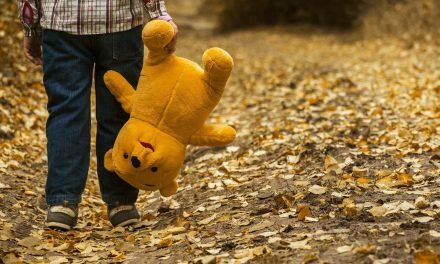 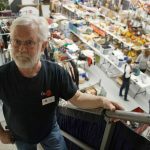 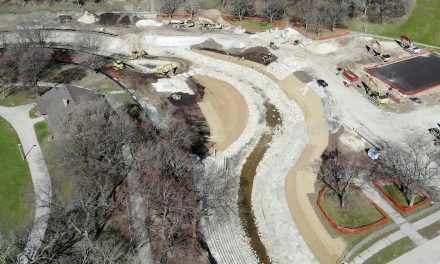 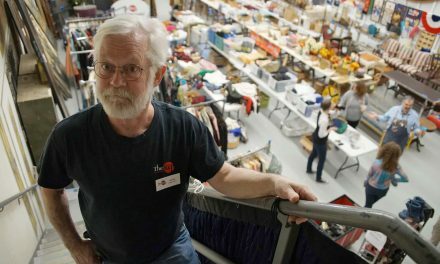 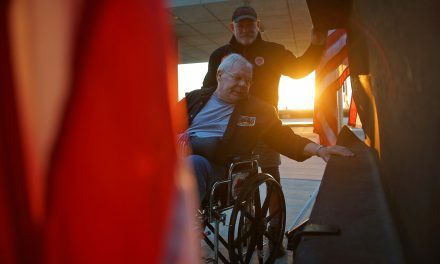 Their focus is to promote awareness of the services and function of The Salvation Army in Milwaukee, help destigmatize areas where homeless populations can be found, and raise funds for the Meaningful Makeover program for emergency lodge residents. 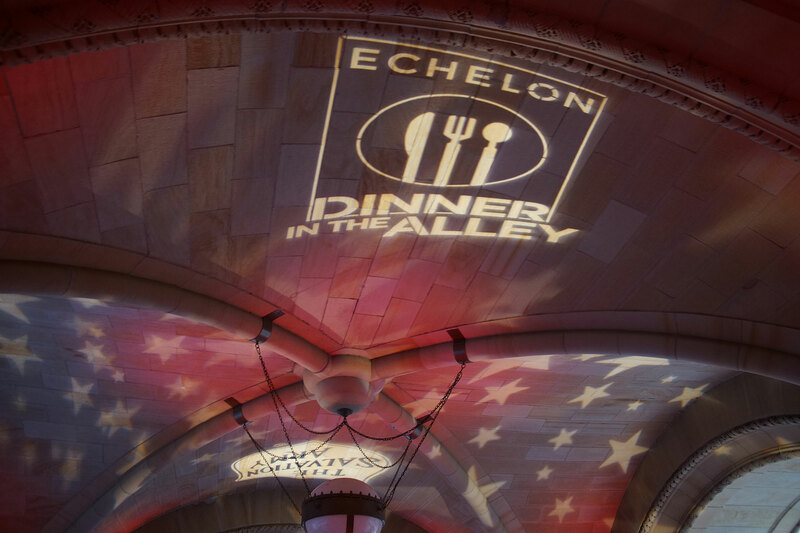 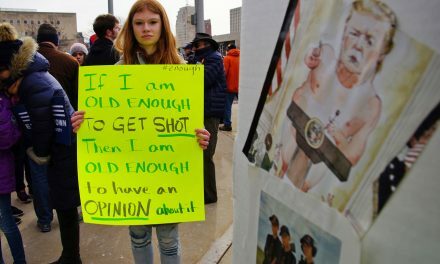 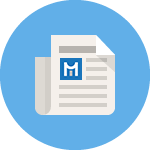 Since its inception in 2014, the number of Echelon groups nationwide has gone from 2 to an estimated 30 by year end of 2018. Both Tschacher and co-president Mary Pelkofer now have a seat with the National Salvation Army Board, allowing them an extended platform to speak about the efforts and work taking place in Milwaukee. 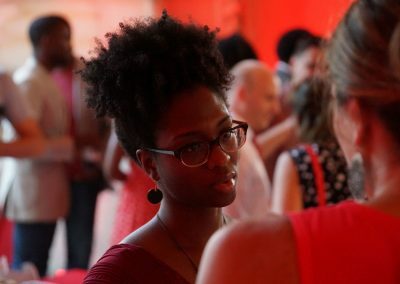 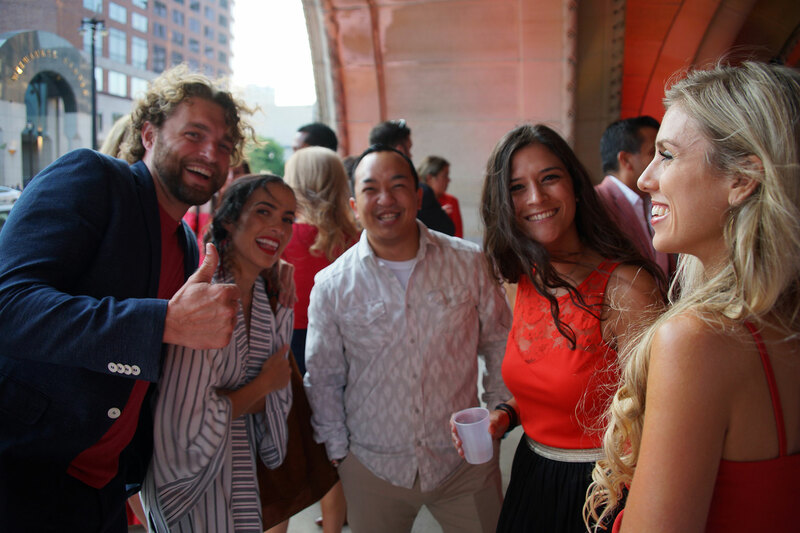 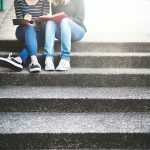 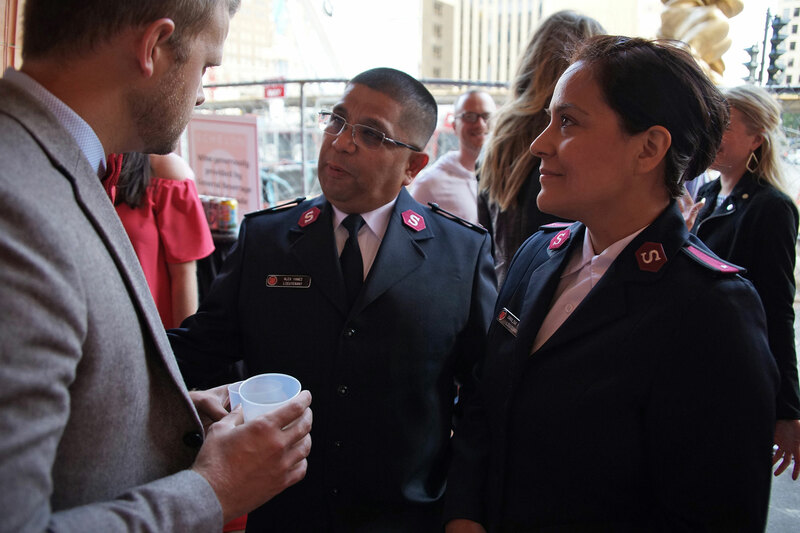 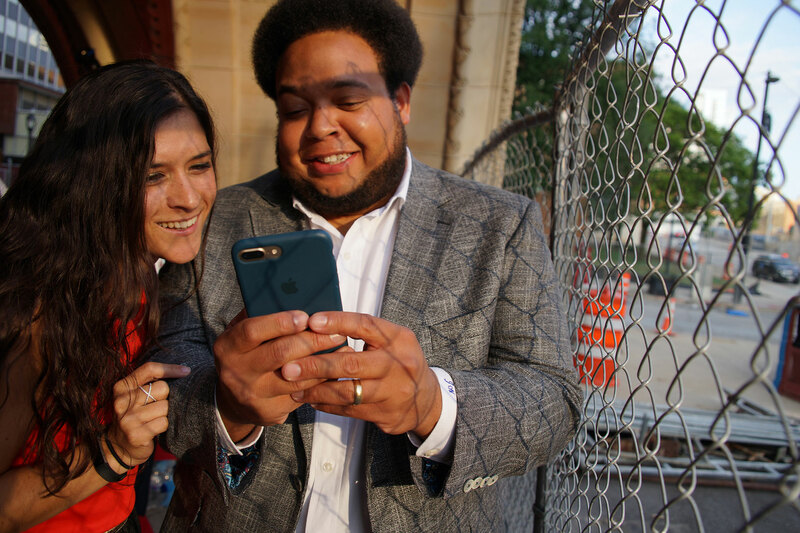 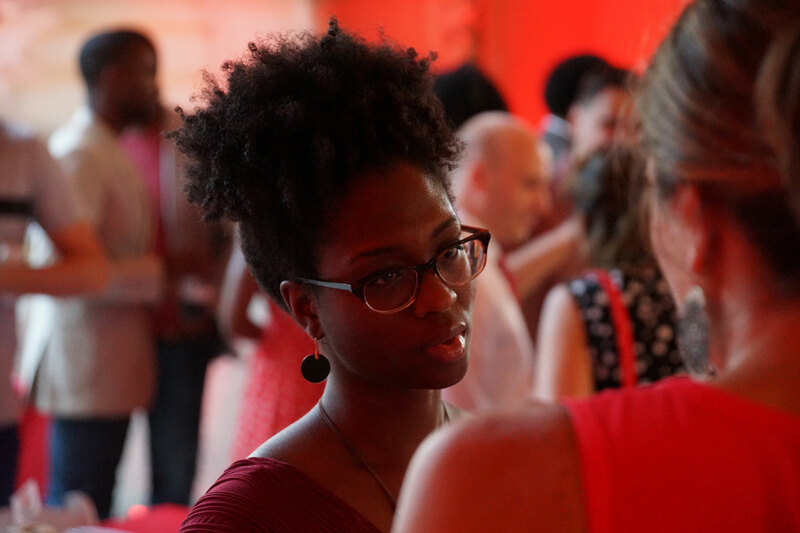 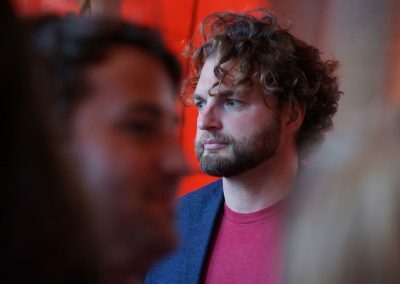 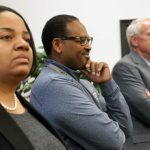 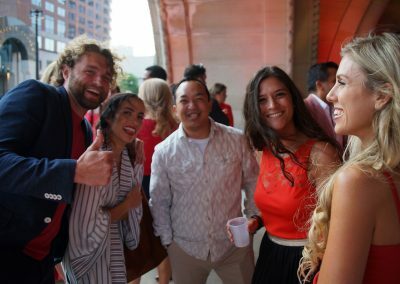 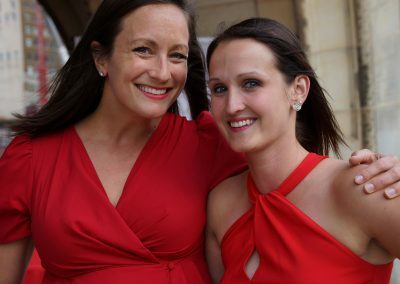 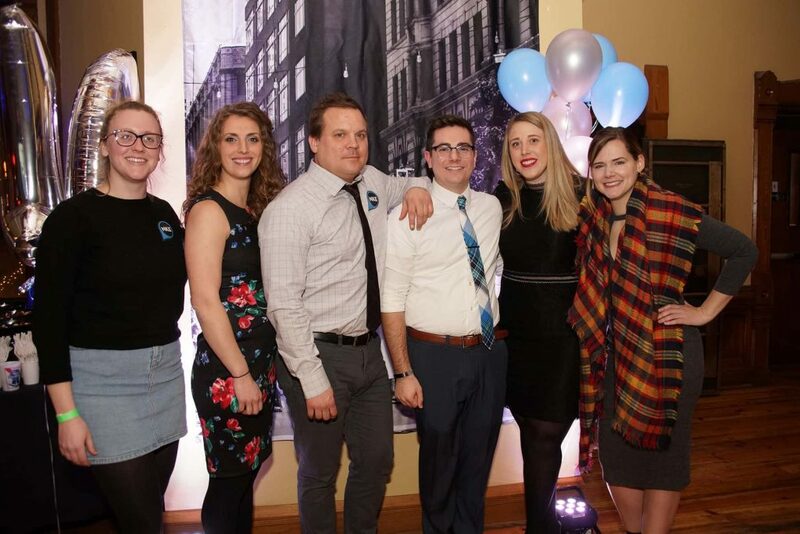 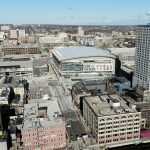 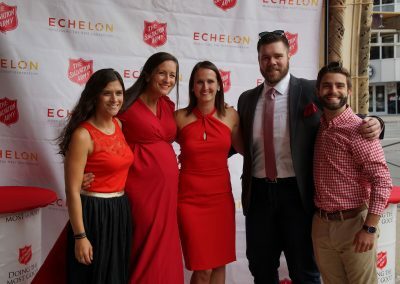 As a local chapter of the National Young Adult Auxiliary of The Salvation Army, Echelon Milwaukee is a community of 50 diverse young professionals collectively serving The Salvation Army in Milwaukee County. 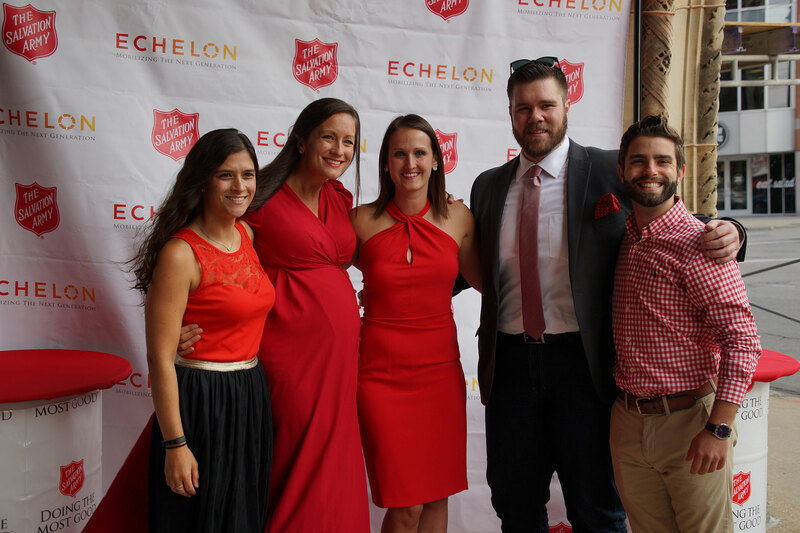 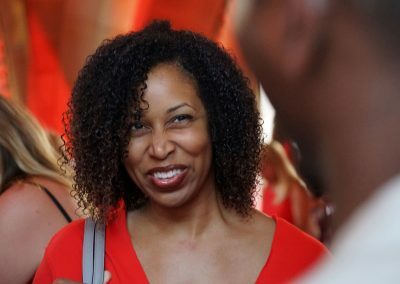 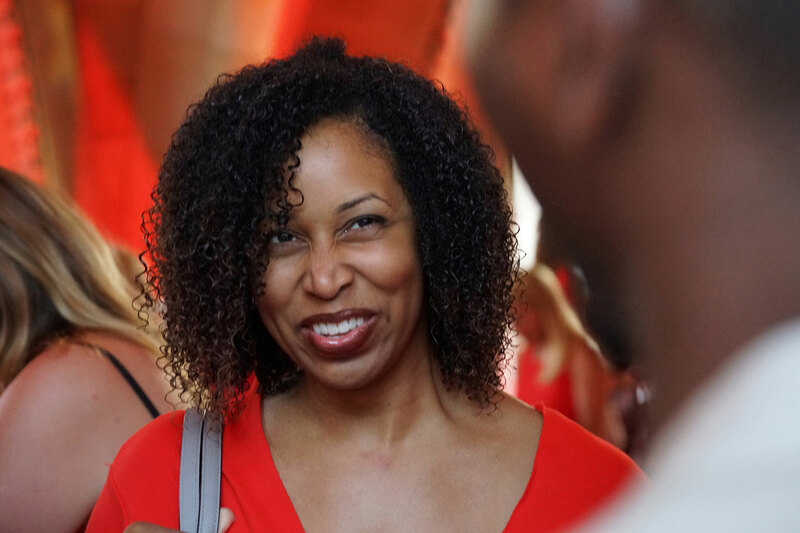 Echelon seeks to mobilize the next generation of volunteers and supporters by providing opportunities for young adults to engage with the organization through fellowship, networking, professional development, fundraising, volunteering and service to others. 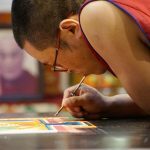 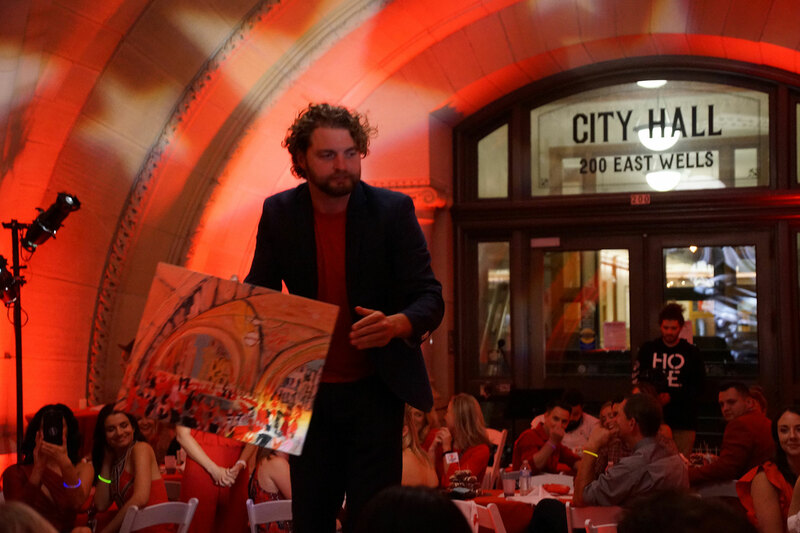 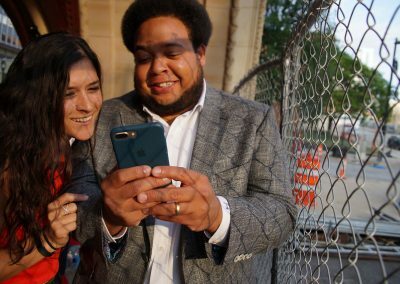 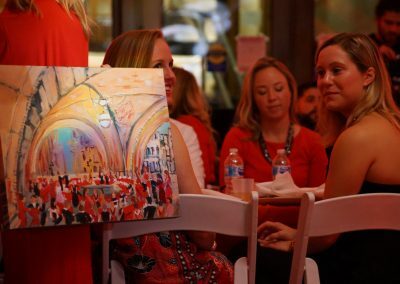 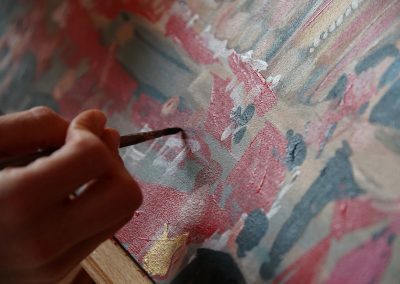 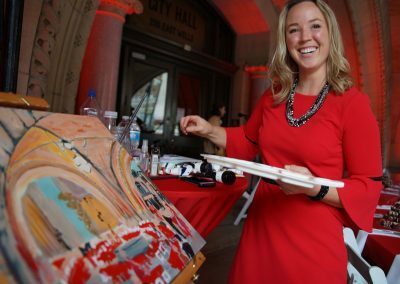 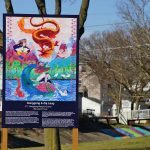 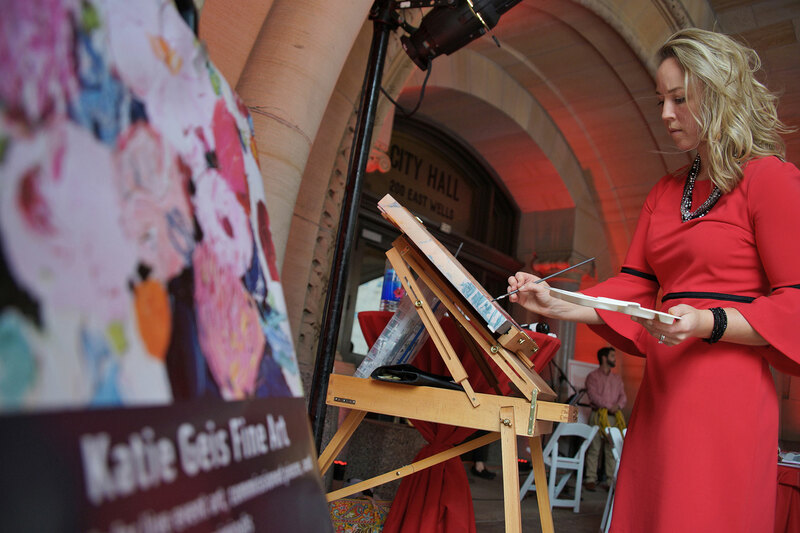 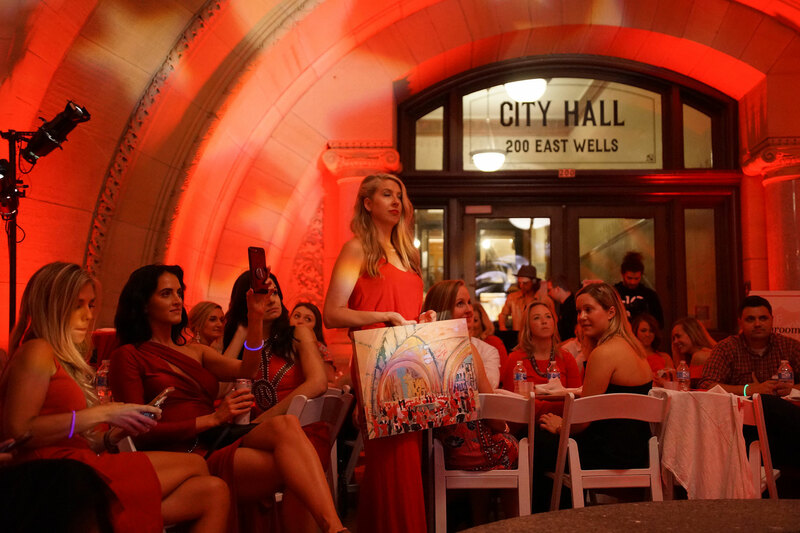 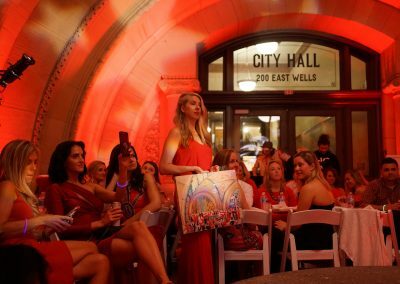 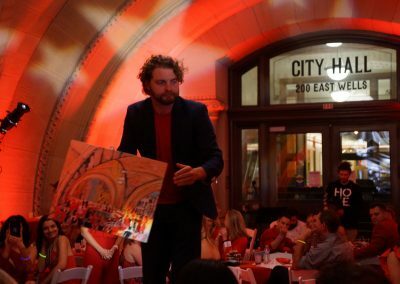 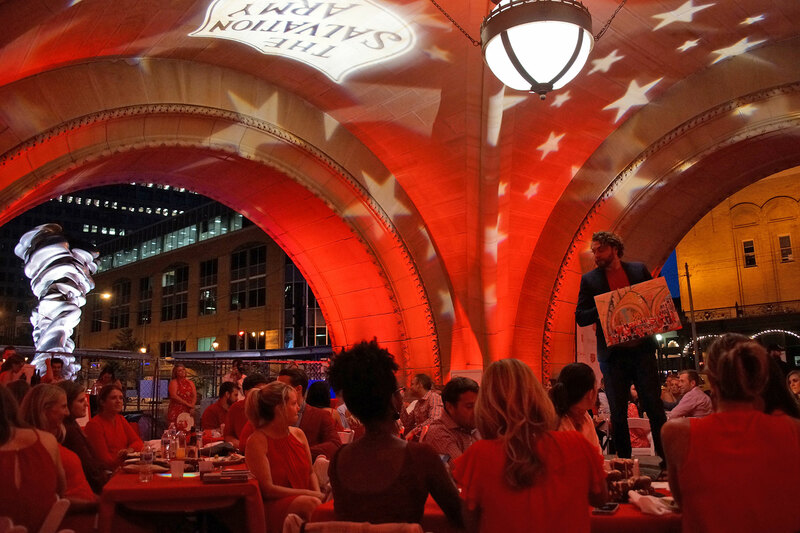 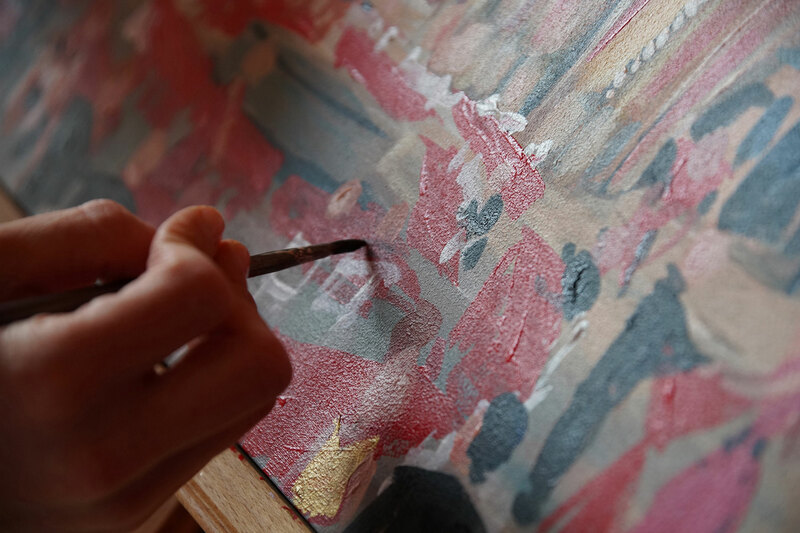 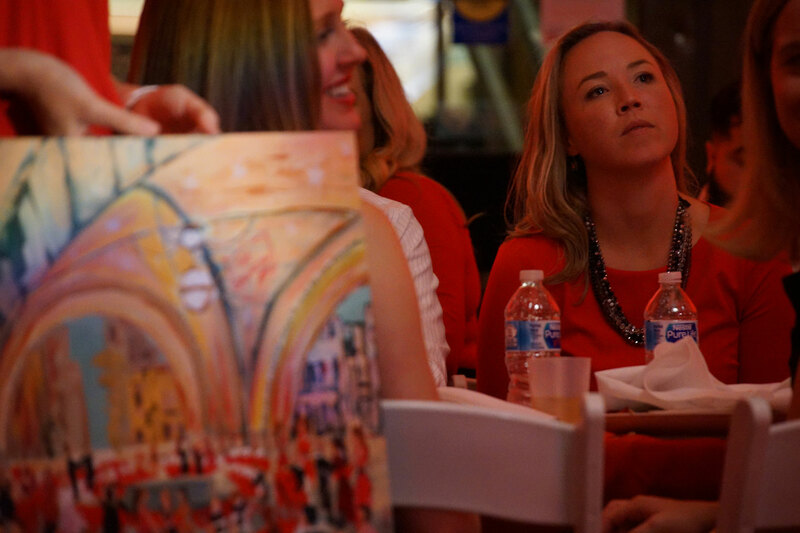 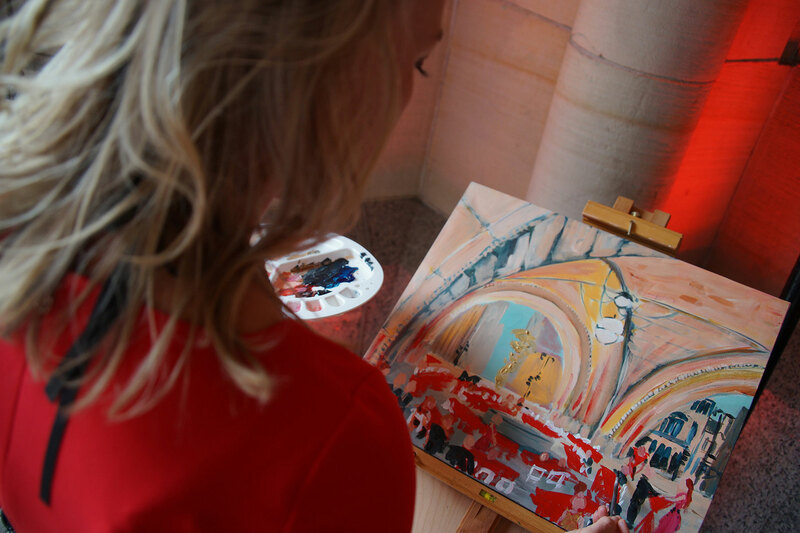 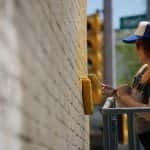 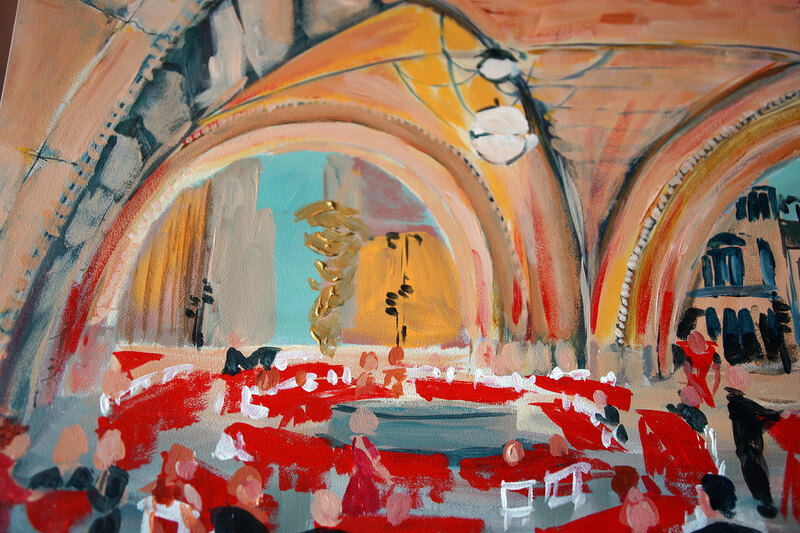 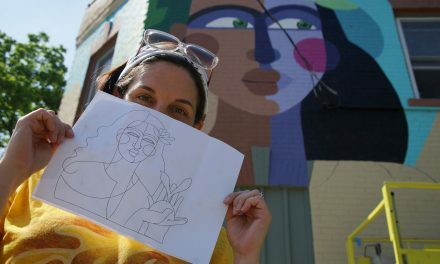 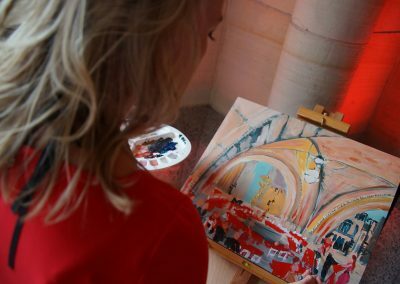 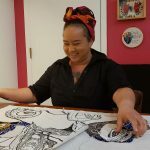 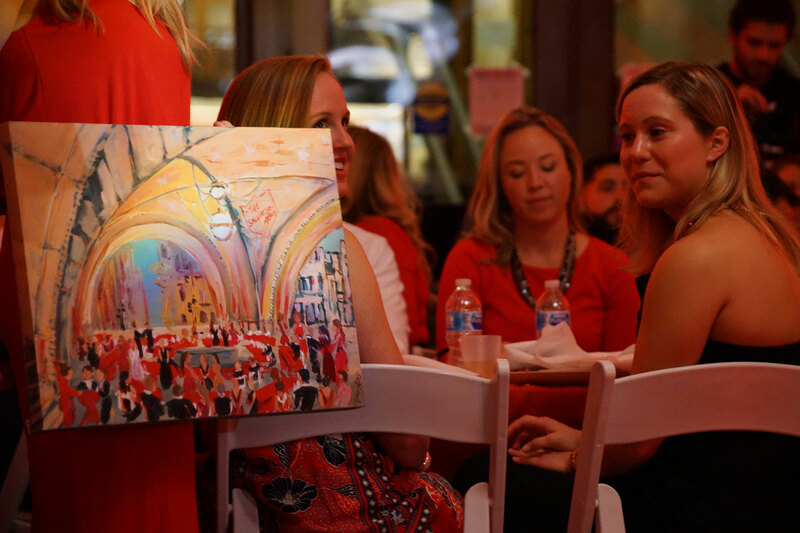 Throughout “Dinner In The Alley,” Milwaukee-based independent artist, Katie Geis, painted the festive scene and the artwork was then auctioned off at the end of the night as part of the fundraiser. 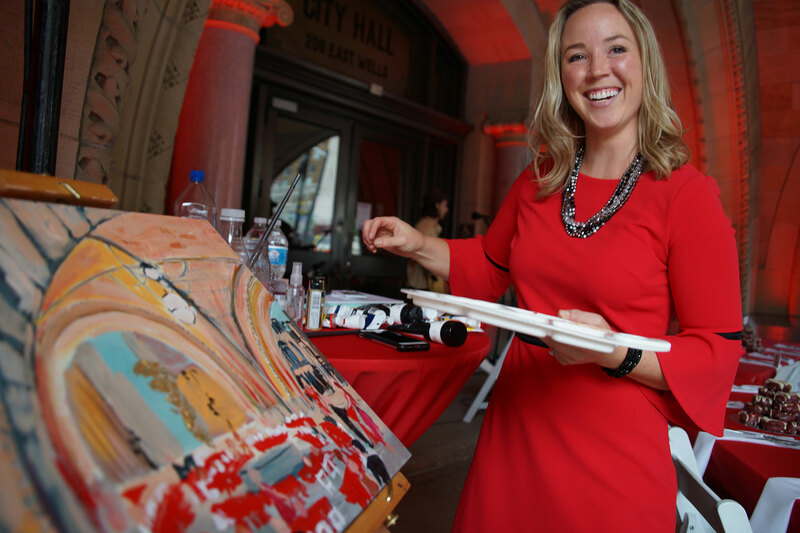 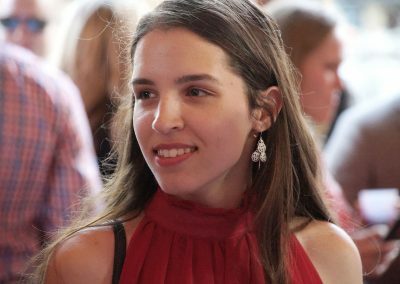 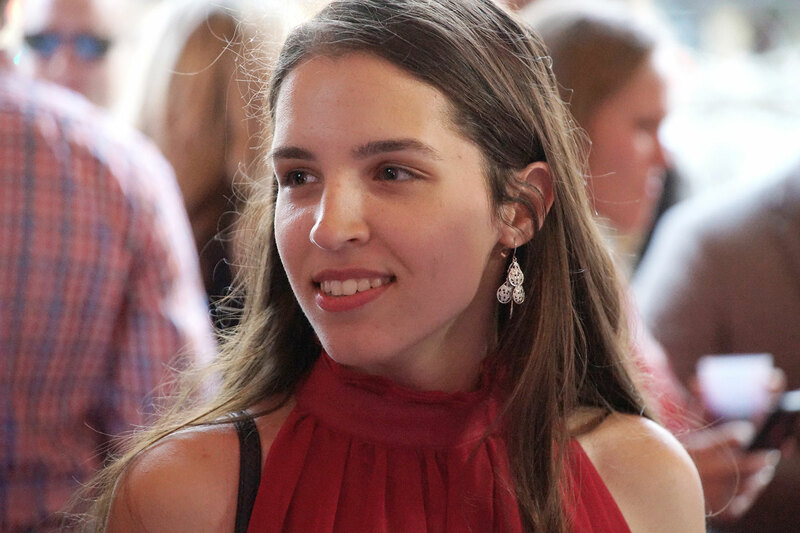 Geis offered her time and talent to the event for the third year because she enjoys using her gifts to give back to those in need.